Like in all golf games, the goal in World Map Golf is to hit the ball into the hole in as few strokes as possible. What makes this game different is that the game is played on a world map that represent the globe; and movement without turning on a globe isn’t always along straight lines on the world map. On a flat surface, where the shortest route between two points is a straight line, we can describe movement and distance on that surface using Euclidean geometry. Euclidean geometry has been the foundation for many 2-dimensional video games and computer games. For games like Snake and Pac-Man, on the other hand, were diagonal movement is impossible; something called Taxicab geometry have been employed. In Euclidean geometry the shortest route between two points is along a straight line. In Taxicab geometry there are many routes that are the shortest. Euclidean geometry and Taxicab geometry have many strengths as a foundation of a 2D game, but also a problem: the periphery. In many games there is no problem to have an edge or another obstacle along the periphery of the game area. But in some games, an edge would distract the gameplay or make the movement to constrained. It is of course possible to create an infinitely large game area, but often there is a need of limiting the area in some way. One solution for limiting the game area without adding an edge is to use some kind of peripheral continuity, were the object that cross the periphery of the game area reappear somewhere else along the periphery. In the case of a rectangular game area, the reappearance is often done at the opposite side of the area and at the same height as the disappearance. This solution have for example been used in classic games like Spacewar!, Snake, and Pac-Man. From a geographical point of view, those different ways of handling with limitations in artificial space is really interesting. But there are also interesting parallells that can be made to world maps and world map reading. Pontus Hennerdal (me) published in 2015 a study were children and adults was asked to point out where along the edge of a world map they thought an airplane reappeared after crossing the edge of the map. A strong tendency that was called linear peripheral continuity (I explain this tendency in this clay animation video on YouTube) was found among the wrong answers. This tendency is very similar to the previously mentioned peripheral continuity that can be found in many computer and video games (and in the case of Taxicab geometry, it is exactly the same). In a subsequent study, the same tendency was shown but also how teaching in combination with improved map design could help avoiding this misleading tendency. Hopefully the game World Map Golf could train players in the ability to find the actual peripheral continuity of world maps and also be able to find the shortest routes on the map. Those routes are not straight lines on a world map but instead follow great circle arcs. The geometry of the globe is therefore not Euclidean geometry. Instead it is non-Euclidean spherical geometry. World Map Golf is a non-Euclidean golf game that is developed with the goal of helping the player to better understand how map projections distort the globe. 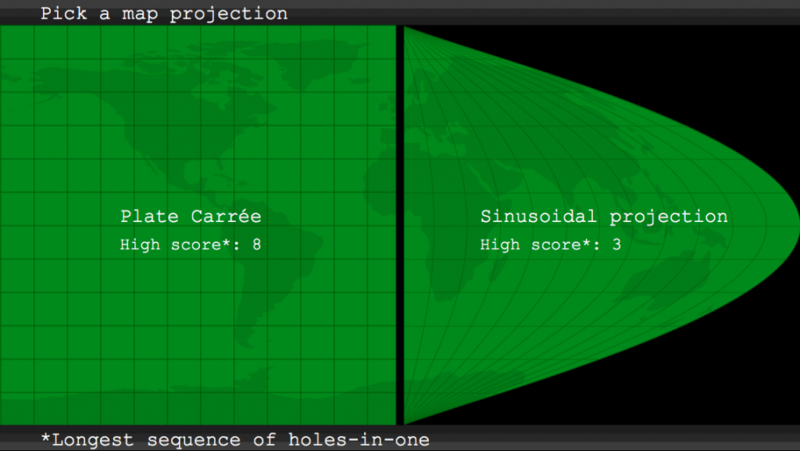 In the current version (World Map Golf 1.0), there is two different map projections: Plate Carrée and Sinusoidal projection. Plate Carrée is a cylindrical map projection attributed to Marinus of Tyre, who Ptolemy claims invented the projection about AD 100. It is the easiest possible map projection to describe mathematically, because latitude and longitude is represented by the x and y axis of the map. Sinusoidal projection is a pseudo-cylindrical map projection that started to appear in world maps in the 16th century. It is an equal-area map projection, which means that relative sizes on the map is the same relative sizes that exists in the real world. How to find the direction? Here is a method of finding the direction to stroke a ball located far from the hole. Find the antipodal point of the hole. This point is located on the other side of the globe in relation to the hole and you find it by going from the hole to the equator, follow the equator a half lap, and then move the same distance as from the hole to the equator but in the opposite direction (see figure below). If the ball is close to the antipodal point, stroke the ball away from the antipode. 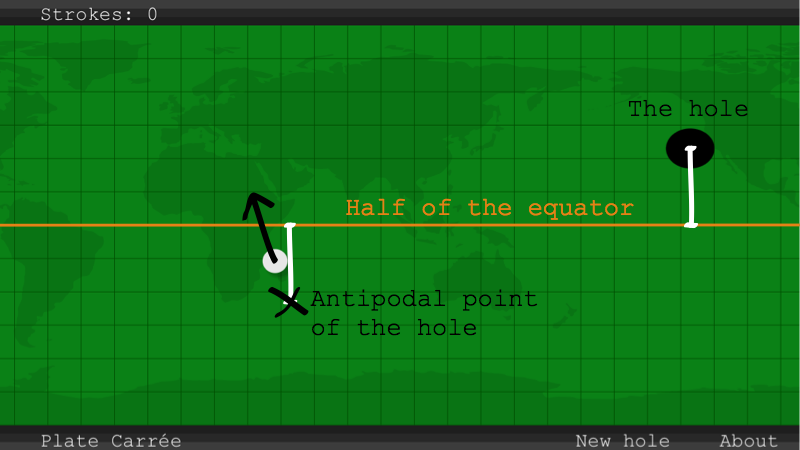 If the ball is located exactly on the antipode, all directions lead to the hole! World Map Golf is designed for iPhone, iPad, and Android devices. Download it for free on the App Store or Google Play. Available in February 2016! Android, Google Play, the Google Play logo, and YouTube are trademarks of Google Inc.